Young and dynamic, Prem Menaria, Director of Prem Group Of Companies was born and brought up in Udaipur. He did his senior secondary with commerce from Shishu Bharati S. Sec. School, Udaipur in 1996. His B.com. and M.com. are from MLSU, Udaipur. From childhood only Menaria wanted to do something different, so just after his graduation he started working at Laxmi Engineering Works. He worked there for about five years. He gained a lot of experience there by his hard work which enable him to set up his own company (Prem Engineering Works) by 2005. From 2005-2009, the company was engaged in machine installation and job work. It was well established by 2010 and work of all types of machine erection was done on turnkey basis. The products of company include Cranes (Derrick, Gantry, E.O.T. and ARM), Water Sedimentation (Treatment) Plant, Gangsaw (Marble and Granite), Block Dressing Machine, Granite Block Cutter (Automatic) Single Pillar Granite Block Cutter), Double Disc Cutter, Portable Edge Cutting Machine (Automatic and Manual), Single Arm Hand Polishing Machine (Marble and Granite), Some other products are Resin Line, Calibrating Machine, Line Polisher (Marble and Granite) and all types of stone processing machines Prem Engineering Works is a leading company in the field of manufacturing the state of the art machines used in marble quarrying, processing and finishing activities. Backed by its experience of over thirteen years it has evolved as a market leaders of world class quality products. Over years it has catered to the needs of not only domestic clients but has also spread its wings in the international market giving a tough competition to its internationally established counter part. Impeccable quality, robustness, reliable productivity with low cost of operation and maintenance of the technical solution used in machine design, ensure the highest performance level. Impelled by the motto of quality product, better services and customer satisfaction, the company uses motor of I-2, I-3 for energy in the long run. Gears made by of leading companies like Crompton & Greaves, Tata Rotomotive and Bharat Bijlee and Shanti Gears are being used. The company has expanded its dealership in southern states like, like Tamil Nadu, Andhra Pradesh, Karnataka and Maharashtra also. Products are also being sent miles away in countries like Russia, Ethiopia, Saudi Arabia, Muscat in Oman, etc. Menaria's factory employees 8 managers, engineers and foremen in addition to a marketing team. In Udaipur there are 3-4 companies of this type and his company is one of the top ones in the field. The tough competition does not defeat the determined Menaria. His principle is not to comprise in quality and not to run down others. His approach is simple. Today there are large numbers of clients who blindly trust Prem Engineering Works. He believes in permanent business and services. Customer satisfaction is all important for him. Timely supply and service are the strong points. PREM MENARIA I would like to be known as a person who is down to earth, and achieved a lot with my hard work. About the scope of business like his, Menaria says that it requires heavy investment difficult to sustain as competition is tough. China is employing new technology with automation through which the employment of the world is adversely impacted. His company regularly participates in the International Annual Stone Exhibition. Menaria's life has been full of difficulties but he has faced them boldly. His marriage was a turning point in his life. He has been getting full support from his wife, MBA Seema who is his role model and is full of new creative ideas. She has worked in HR department of Biyani Girls College, Jaipur. As she had taken full responsibility of domestic matters, Menaria is free to devote himself to his business. She is also Director, Seema Engineering Industries which manufactures Mineral based machinery and stone crusher plant on turnkey basis. Menaria is also much concerned about his helath. He gets up early at 6:00 and has one hour walk at Fateh Sagar Pal. He also spends a long time at Gym with his wife. He takes some fruits as his lunch in the office. Evening walk is for 30-45 minutes. Dinner is light consisting of fruits and salads. About 2 hours are spent in watching news and entertaining or motivational TV serial. On weekends the family goes to movies, and to eat out. Once a month there are trips to places like Jaipur, Delhi, Ahmedabad and Pawagarh. There are meetings, kitty parties and picnics once a month. He likes the company of those who help and motivate him in his business. He played football and also participated in many championships in his student days. Old films and songs are his favourite. He reads literature about engineering. Son Priyanshu, a student of class 10 is very much inspired from his dad and wants to become an automobile engineer. Daughter Nimmi is studying in class two. As President, ROTARY CLUB UDAIPUR MEWAR, Menaria is taking up several projects, especially for the welfare of below poverty line people. 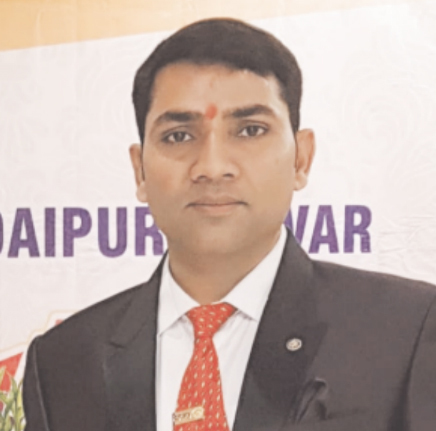 His vision is to set up an accessible BLOOD BANK for all sorts of people and he is highly interested in contributing to the making of Udaipur a Smart, Clean and a Green city. At present, he is also the executive committee member of KCCI (Kaladwas Chamber of Commerce and Industries) where he is also contributing in the project GREEN KALADWAS, CLEAN KALADWAS . As President of the society of the complex in which he resides he has introduced power savings LED lights and rain water harvesting plant. In future, Menaria's plan is to enter the field of education in which Seema is keenly interested. It is a good way to serve the society. For Menaria God lives in one's heart and always listens to sincere prayers. He believes that there is no age bar for learning and one should keep learning from good people. He would like to be known as a person who is down to earth and achieved a lot in a short time with his hard work. He is all praise for Udaipur city and suggests that it is the duty of every citizen to keep it green and clean. He believes that every citizen must plant at least one sapling on their birthday or some other occasion, so that the environment remains protected. From the success story of a person like Prem Menaria, a gritty and self motivated entrepreneur one can learn a lot.